I don’t know how old my chain and sprocket were, but I’ve done 17k on them and the bike has a total of 30k. I have every reason to think it’s original, so not bad going. 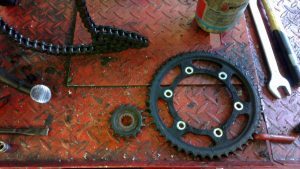 The front sprocket was showing a little hooking and I was able to pull the chain away from rear sprocket quite a bit. 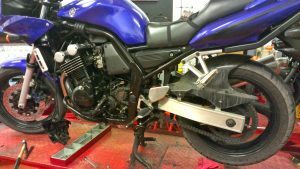 The bike also still had the original 9mm front sprocket nut, which should have been upgraded to the newer 12mm one, due to reports of it coming loose and causing all kinds of trouble. So this was sorted to. 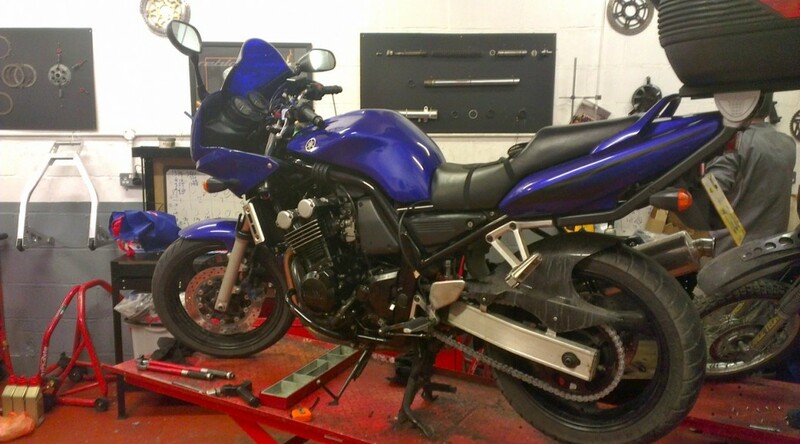 I also replaced the rear shock which was started to get a bit elderly. I had picked up a couple year old Hagon shock going cheap. Not the best, but a good price and damned sight better than the old one. The new shock has made a lot of difference to the feel of the bike. Much smoother over the bumps and inspires an lot more confidence. 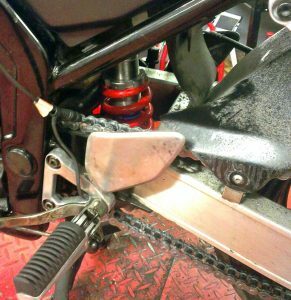 Lastly, Matt noticed my foot pegs were a little loose, so we stripped them down and re-greased them. For future note, I much do check your rear brake light after working on the right hand peg. I had managed to hook the brake light switch spring onto wrong bit of pedal and ended riding about for the following day with rear brake light stuck on – doh! Overall, a good day, lots done, lots learnt. Better than tinkering away outside in the cold on the drive, making do with the minimal tools I’ve got and never 100% sure you’re doing everything quite right. Will definitely be back down to OMC for future work.